Kevin Hillstrom: MineThatData: Where Are We Headed? Discovery / Trending: There's too much information, and you certainly don't want to be wrong. You want to be part of the club. When you know that this squeeze-a-bean (click here) has been saved by more than 6,000 people, you know you're not buying a dud. There will be countless intermediaries and countless lists ... everything ranked, scored, and measured. Intermediaries: There will be intermediaries. Within any service created by those with financial incentives, there will be tastemakers who do the work, mostly for free. It's a sharing economy - so almost nobody makes money except the folks who create the intermediary. In the old catalog world, the co-op was the intermediary. In the first generation of e-commerce, Google was the intermediary. In early social, Facebook was the intermediary. Each niche will have a customized intermediary - requiring omnichannel integration - or not - there's no reason why a brand has to "work" Wanelo when a tastemaker on Wanelo can do the work for you, for free, as long as you have something worth sharing. Something Worth Sharing: This is so important. How do you make information about a basic hot dog "worth sharing", for instance? Maybe you spend decades creating an event that is popular enough to, over the past ten years, get televised nationally - on July 4. Look at Nathan's stock price run-up in the past decade - a decade that coincides with ESPN's broadcast of their July 4 event (click here). All for a boring hot dog that faces infinite competition. The biggest challenge old school direct marketers seem to have is the concept of sharing. Twenty years ago, twenty percent of catalog demand was called "passaround" or "passalong" ... the demand came from a name/address different than the name/address printed on the catalog ... in other words, the catalog was "shared". Catalogers loved it ... "free marketing" as Glenn Glieber would call it. Today, younger brands also measure their ability to get things shared ... the "viral coefficient". Something worth sharing leads to "free" customer acquisition ... maybe the most important metric to measure. There are many ways to get your content/product shared. Create something so undeniably great that people have to talk about it (i.e. a Cabelas Store or Apple Store, for instance). Good work if you can find it. Create an event peripheral to your product (i.e. 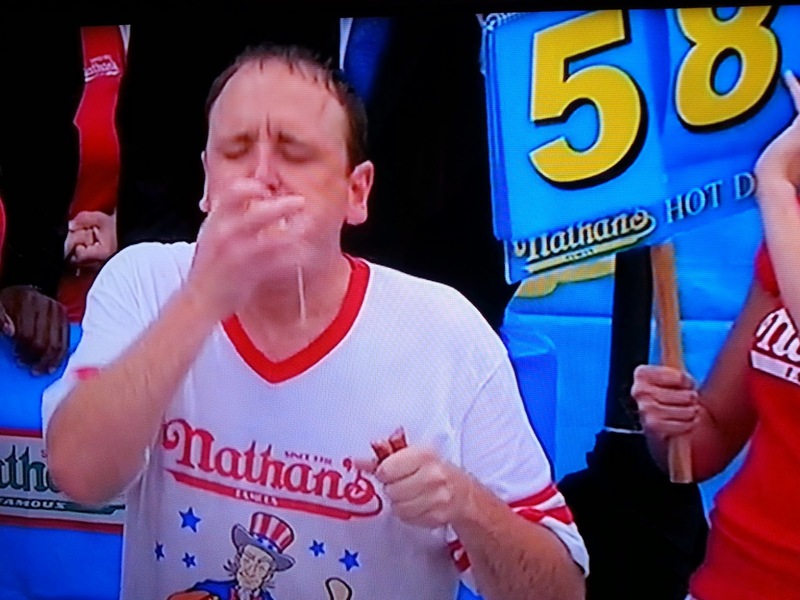 the Nathan's Hot Dog Eating Contest on July 4). Participate in every channel and astroturf the results in your favor (omnichannel). This is the "best practice" ... which tells you something about best practices. Offline Seems Pretty Important: Twenty years into e-commerce, and e-commerce sales are still a spec compared to offline retail in-store sales. We've learned that offline creates demand, while digital steers and captures demand (yes, I know, digital can create demand ... but nowhere near as powerfully as offline does ... and the experts mostly chose to focus on capturing demand as an expertise since it is so difficult to be talented enough to actually create demand). Go spend some time on Twitter - it's people digitally interacting with offline activities - without the offline activity, there's nothing digitally to experience. Think about the World Cup Soccer/Football tournament ... without all those full stadiums and excellent players and old-school television broadcasts, there's nothing to talk about. Nothing. Offline is critical. Demographics Matter: Your Grandparents are not going to use Spotify. And your seventeen year old daughter is not likely to purchase from a Garnet Hill catalog. The omnichannel people have it all wrong ... you don't "leverage" all channels in hopes of attracting all customers. Pick your customer demographic, and pick the channels that appeal to your customer demographic. But Merchandise Matters Most: If you don't sell something that your customer craves, why are you in business? The vast majority of conversations I have with Executives fail to inspire any mention of the merchandise being sold. How is that even possible? Go read what customers have to say about your business ... the majority of the discussion is about merchandise and service. Furthermore, what we offer dictates the customer we acquire. You cannot sell an item that a 72 year old customer appreciates and hope, via an omnichannel strategy, that the 27 year old customer will buy it because it is available on Pinterest. Strategy = New Products: If you ask 100 marketers how new products are performing, you're going to be lucky to get 3 accurate responses. What an abdication of responsibility! But those same 100 marketers can tell you how often a discount/promotion message on Twitter was re-tweeted. New products mean everything, EVERYTHING! 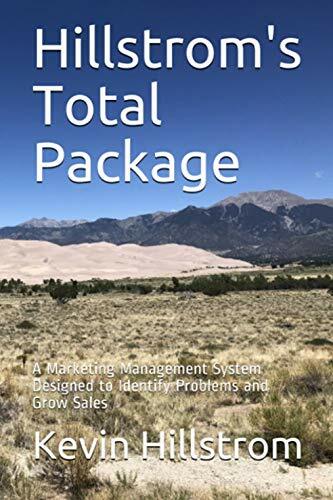 In 80% of my Merchandise Forensics projects, you can easily pin the blame for business failure on a multi-year failure to introduce new products, new products that sell well. Your existing customers are bored - thrill them!! The strategy is important because it guarantees future success (long-term), and it gives customers something to talk about (short-term). Why astroturf success when great new products can be shared and discussed by customers and prospects, for free? Data: Everybody wants your data, because they can monetize your data. They earn profit off of your hard work. How do you think flashlight apps on phones survive? Altruism? Ha! You will either create data and profit from it, or you will create data, give it away to the 1%, and then repurchase it back from the folks you gave it away to. Which side do you want to be on? Omnichannel: You will do more and more for less and less. Vendors, Consultants, and Trade Journalists love this, because they get paid when you do more and more. Why do you think IBM or Oracle or McKinsey or Forrester preach the message to you? They get paid! You are able to prove that every single channel interacts with every single order - but customers over the past twenty years still buy 2 or 3 or 4 times a year (go analyze L.L. 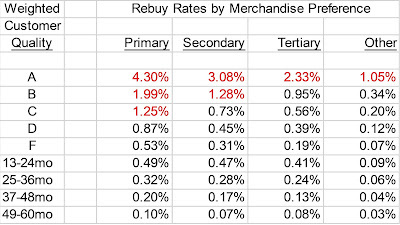 Bean's twenty year repurchase metrics and orders per year and report back on what you find). We can measure everything, but we cannot influence hardly anything. This trend will only get worse as time progresses. No Middle: Like so many internet theories, we're going in the opposite direction of the theory. The internet leaves no room for a middle class ... in e-commerce, there's the 1% (Amazon) and everybody else. Folks call this "scale". It's going to be harder and harder to have $50,000,000 to $500,000,000 businesses. It's going to be easier and easier to grow a business to $5,000,000 or $10,000,000, and then you hit a brick wall. Thump. Hype: We've all seen the nonsense it in content marketing - go visit The Weather Channel website for specific examples. "Eight Shocking Images That Will Change The Way You Think About Apples Forever". To either stay in the 1%, or to try to cross the bridge between everybody else and to achieve scale, many folks will attempt hype. This will provide countless opportunities for folks who operate with honesty and integrity. Merchandise + Service + Story: This is the opposite of omnichannel and hype. It's the secret to success in business. Many will try to cut corners. Try hard to perform honestly. Catalogers: Turned out opposite of how I thought it would turn out. I was wrong. Back in 2007, I thought catalogers would go through short-term pain but emerge as reasonably healthy e-commerce businesses. Instead, the vendor industry convinced catalogers that paper and renting names was essential (I've been in the meetings, I've heard the sales pitch from the vendor community). Catalogers listened. Today, the majority of catalogers I analyze possess a 60+ year old, rural customer who loves catalogs. Half of the US population is under the age of 45. It's terribly common to see 10% to 15% of the catalog customer file under the age of 45. In other words, the vendor community and catalog executives who love cataloging more than merchandising ran the future of cataloging right into the sewer. And everybody seems perfectly content with this outcome!! "We've decided that we serve the 72 year old retired professional with money to spend." Thirty years ago, you served a 42 year old professional with money to spend. What happens to your customer in 10 years? If I saw that catalogers could effectively acquire younger (i.e. 50 years old) customers, I'd be highly optimistic about the future. Instead, catalogers have chosen to support the vendor community vision of cataloging (which keeps the vendor community in business, by the way), and are following a cohort of the population to a logical outcome.